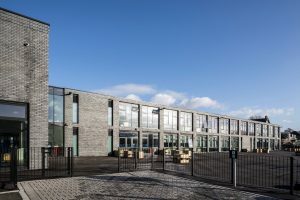 Avtek Solutions has reinforced its position as one of Scotland’s leading curtain walling fitters by successfully completing the contract to design, supply and install the curtain walling, commercial windows and doors for Kirn Primary School in Dunoon. As part of the project which included a refurbishment to the existing Victorian building and the development of a new 2 storey building, Avtek installed Metal Technology System 17 capped curtain walling, as well as System 4-35HI Thermally Enhanced Casement Windows and System 5-20D doors to ensure compliance with the latest thermal requirements of the current building regulations. With much experience in the education sector, Avtek drew upon their expertise specifying Teleflex winders which they installed to enable the manual, yet safe, opening of higher level windows as well as electric actuators for inaccessible windows to provide much need ventilation to the classrooms. Kirn Primary School now boasts a bright and modern environment providing a first-class educational facility. But the success and timely finish of the project was no doubt, in part, due to the quality of Avtek’s project management.